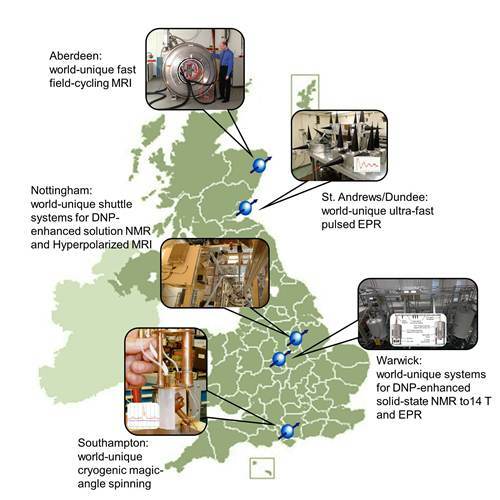 This Centre for Doctoral Training (CDT) in Integrated Magnetic Resonance (iMR) involves internationally-leading researchers at the Universities of Warwick, St Andrews/Dundee, Southampton, Nottingham and Aberdeen as well as all the major industrial Magnetic Resonance companies. It draws together the full range of technology-driven research and training activities in magnetic resonance (MR). The combination of expertise and infrastructure provides the environment for training of a new generation of PhDs who have a deep appreciation of how science and technology drive each other. The Centre offers a range of modules, delivered over the internet and at residential workshops. These provide an unparallelled breadth of training in MR as well as other key elements related to implementing new technologies, such as understanding the innovation chain, together with broader skills including communication and team working. Some of the training will be offered in direct partnership with key players from the MR manufacturing sector who are closely involved in all aspects of this CDT. PhD Projects were available at the Universities of Warwick, St Andrews/ Dundee, Southampton, Nottingham and Aberdeen spanning the fields of Magnetic Resonance Imaging, Electron Paramagnetic Resonance, Nuclear Magnetic Resonance and Dynamic Nuclear Polarisation. Our goal is to unlock creativity and stimulate new technological developments in MR furthering the reach and increasing the impact. The programme was open to graduates who would typically have, or be on course for, a 1st class degree in Physical Sciences, and were looking for a challenging, interdisciplinary research training environment and had an active interest in the development of new technologies. Funded 4 year PhD studentships include maintenance of £14,000 (tax free) per annum, as well as fees and an enhanced travel budget. At least 10 places were available each year from 2011 to 2013 for September entry. A list of example projects can be found here. Please feel free to contact the project supervisors. For further information please contact Mark Newton (m.e.newton@warwick.ac.uk), the iMR CDT Director.